I guess the two words that best describe this harvest are œlate and œsmall. Actually, the last three harvests have been late. The three main influences on maturation are heat, light and moisture and these last three years have been noticeably cool, which explains why the grapes have taken their time ripening rather than rushing to the finish line. Kind of like trying to get your tomatoes to ripen on a San Francisco rooftop. The long œhangtime is terrific for flavor development but a little hard on the nerves. There are various causes for the low yields but the main influence was ill-timed rain last spring when many varieties were flowering. The rain doesn't necessarily affect quality, but pollination is impaired which, essentially, thins the crop before it's even on the vine. Bloom time varies by variety and location so damage was site specific. Our late-to-flower Cabernet Sauvignon yielded just slightly less than normal while we really took a hit in the Chardonnay and Merlot. Our Knollwood Vineyard Merlot, here in the Oak Knoll District, was late which was no great surprise and yielded just a hair over two tons per acre. The vines are twenty years old, now, so we don't really expect them to reach the valley average of about four tons per acre, but this is the smallest crop we've seen in the last decade. The fruit showed everything you love about Merlot “ great texture “ so rich and supple with nice, bright flavors. Our two blocks of Cab Franc are always interesting to watch develop between the differences in soil and the four different clones we planted “ five individual blocks in all. Each has its own personality and they show a range of expression from medium bodied with bright fruit to bigger, deeper and more tannic. It gives the wine extra layers of complexity. We grow Cabernet Sauvignon in three different locations where Cabernet does best: Yountville, Rutherford and St. Helena. The story with Cabernet this year is really great flavor development early on, especially in our Tietjen vineyard in west Rutherford. These are mature vines, planted in the early 80s, the Tietjen vineyard in 1987. Our Cabernet harvest began on October 20th, one of our latest starts ever, and finished November 2nd. The yields were off just slightly in these vineyards, around 2.5 tons per acre. After such a challenging vintage it feels good to have all the grapes safely œin the barn. My job's done and now the ball is in Chris' court! More from him soon." 1. overflowing with fervor, enthusiasm, or excitement; high-spirited. 2. bubbling up like a boiling liquid. We drained and pressed our Pinot Noir lots in mid-October. Now three weeks into their barrel aging, the wines are starting to shake off their youthful exuberance and are embarking on their graceful transitions into wine. In addition to continually tasting through all of the different lots, this is a time for us to run preliminary analysis on the wines. One of the numbers we run at this time is the alcohol. To do this, we use technology that is hundreds of years old and based on a simple concept. We use an ebulliometer. We boil water and record the temperature to within a tenth of a degree. Then we boil the wine sample and record to a tenth of a degree as well. The difference in the boiling points is an accurate gauge of the alcohol in the wine in almost all cases. The science of ebulliometry is appropriately named ... you might think of the results as a measure of the happy units in the wine. We learn from teachers and books that yeast convert sugars to alcohol at a ratio of 0.595. My observations in the cellar have been that the conversion is generally closer to 0.610, so thats the number I use for my pre-harvest calculations. For example, I would expect a batch of grapes at 24.0 brix to produce a wine around 14.6% alcohol. Tracking metrics like this is helpful for us to make projections about our wines, as most of a winemakers decisions are oriented towards how a wine will taste in the future, not how it tastes right now. That said, and with the caveat that we constantly generate an unbelievable amount of numerical data about our wines, what really makes me ebullient is tasting them and getting to know our wines on a personal level. With the primary fermentations complete and the Pinot Noir settled down a little bit, we can begin to see the personality of the different lots express themselves a little more clearly. We grow four different clones of Pinot Noir on the Home Ranch vineyard which surrounds the winery grounds. Clones are sub-designations of a given varietal, generally selected for specific and positive attributes and propagated (cloned) from cuttings. 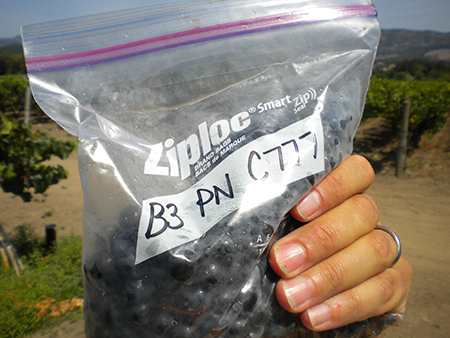 Our Pinot Noir clones are 777, 667, 113, and 115. While they ripen similarly, each of these clones has a subtly different tone that is appealing and complementary. I find 777 to be ripe in redberry flavors and round on the palate. 667 tends more towards floral tones on the nose and has a lighter body. 113 generally has lighter berry tones and a little more midpalate. 115 tends to have the darkest berry flavors and a little more tannin than the others. I don't have a favorite. I like the differences in all four clones. In most vintages, I prefer the blend of the clones over any individual one. Most of our Pinot Noir this year was picked between September 27-30 this year, almost three weeks later than what we consider 'normal'. 2011 was a wonderful year for Pinot Noir for us. We grow our Pinot Noir in a reasonably warm area for the varietal. The cooler, longer season our Pinot Noir experienced this year allowed the fruit to ripen fully, but more importantly slowly, and without the typical fast rise in sugars that we would usually experience were we to let the fruit hang that long in a warmer vintage. In 2011, I've isolated 4 small batches of clonally designated free run Pinot Noir from Block 3 and a small batch from Block 2 as well. These wines are tasting fantastic in barrel right now, displaying loads of berry fruit and taking on the some of the nice toasty tones from the new french oak barrels that they are settling down in. I'm not sure if we'll bottle these clonal designates separately, but we might. It would be fun for our Monticello Faithful to experience these distinctive components that are the building blocks of our wines. Stay tuned ..."
We're navigating our way through a very interesting growing season. Navigation as opposed to destination is a theme we'll revisit in posts later in the season. At this stage, we've got all of our Pinot Noir harvested, fermented and pressed. I'm very excited about the quality of the wine we have in barrel. Careful sorting in both the field and on the crush pad delivered immaculate fruit to the fermenters. The slower pace of this vintage so far has been really nice as well, allowing us more time than usual to belabor over the details. One detail that we monitor daily is brix and temperature of our fermenting batches. 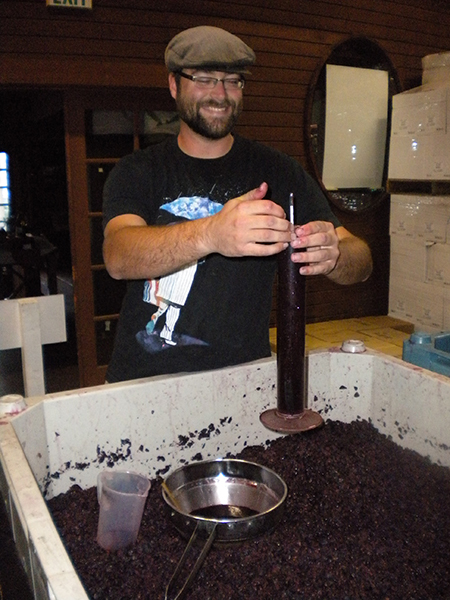 On average, I figure our enologist Mark measures about 50 brix readings over the course of a crush day. Over the course of two months, thats 3000 brix readings a season for him. This is his sixth vintage with Monticello, so he's likely run something in the neighborhood of about 18,000 brix readings in our cellar. He's pretty good at spinning a hydrometer. Despite all the advances in technology and science related to winemaking and enology, we still rely on some pretty simple concepts to track our wines on a daily basis. Our measurement of brix is done with a hydrometer. 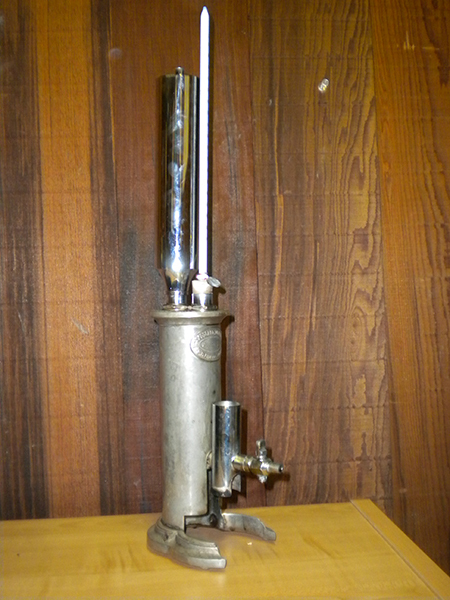 This is a simple enclosed and vaccum sealed hollow glass cylinder which floats in the fermenting juice. The heavier (or denser) the liquid is, the higher the hydrometer floats. The lighter (or less dense) the liquid is, the lower the hydrometer sinks. The hydrometer is gauged so that you record the level it floats at and monitor the fermentation thusly. The weight of a liquid is sometimes referred to as its 'Specific Gravity'. Clearly, the monitoring of our ferments is of grave importance to us. Freshly crushed grape juice is pretty thick. It usually is about 24-25 brix (roughly 25%) dissolved sugar. Finished fermented wine is much lighter than the juice it was fermented from. This is because alcohol weighs less than water. Accordingly, the hydrometer floats high in grape hjuice and sinks low in wine. We can monitor within about 1/2 brix (1/2%) range the progress of the fermentation simply by spinning this little device in a cylinder of the fermenting juice. The reason we spin it is to pull off any CO2 gas bubbles that may form on the cylinder and cause it float higher in error. Mark usually spins with his thumb and forefinger in a clockwise direction. We've wondered recently if he would need to spin counter-clockwise if we were working in the Southern Hemisphere (apparently things go in the other direction on that side of the rock. Maybe we'll plan a trip someday down under to investigate. All that said, really all we're doing is floating a tube in the juice, using the same concept as the hydrometers we made from plastic pipes inhigh school science class. Simple, but specific gravity. Although there is a lot of technology and some pretty complex ideas related to winemaking, much of it is based on basic concepts and attention to detail. I think much of life is the same. Seemingly complex systems usually can be condensed to a simpler core concept. Not unlike your enjoyment of our Monticello wines. There are lots of ways to banter about wine, with exotic lingo and wild metaphors. At its core, it really just boils down to 'Yum' or 'Yuk'. We hope you experience the former with Monticello. What are simple descriptors you use to talk about wine that are meaningful to you? Next Post : An Ebullient Pinot Noir"
Our family has been in Napa a pretty good long time. We've been growing grapes for 40 years and making wine for 30. Our dad settled in in the beginning of this current incarnation of Napa Valleys history which I would submit began in the mid to late 1960s. We're still innovating and learning and always looking for and creating ways to do what we do better, but for the most part, we've figured out what works and what doesn't. When you've done something for a long time, eventually people will seek your opinion, and value your advice on how they might be able to conduct certain aspects of their business. We don't do a lot of consulting ... we've got plenty of grapes and barrels of our own to keep ourselves entertained, but every now and then a project will come along that sounds like so much fun, we jump in. One such project is in the Valle de Guadalupe of Baja, Mexico. 2011 will be the fifth vintage of our consultancy in Baja. The wines are tasting great, and we're confident that the producer will soon be releasing the best wines that Mexico has to offer. The trips to the vineyard and winery are enjoyable, although the days are long. The people are friendly and the food is fantastic, some of the best meals I've had over the last several years have been in Tijuana. Working on these types of distant projects would have been difficult when our dad, Jay, first started Monticello in 1969. The travel would have been slower, communication would have been limited to landlines and perhaps the pony express. It would have been extremely challenging, perhaps impossible to oversee the dynamic details of a winemaking operation from a distance. Fast forward to 2011. My brother, Stephen, has done a wonderful job with our internal computing, setting us up with remote access to our desktops and funneling all of our communications to our phones. With Wi-Fi everywhere, it is increasingly easy to stay connected and function in real time, even if the project is 600 miles away and across an international border. I can't imagine that our dad could have ever imagined that someday we could be sitting on an airplane, with full internet access to their desktops and being nearly as productive at 6 miles up as we are behind our desks (of course I'm just sitting up here in the sky writing a blog post, but you get the idea). For that matter, the internet alone wasn't even on the radar. All that said, the technology won't necessarily make our wines any better. It will, however, make it easier for us to make more of those better wines, and to explore areas that may have previously been out of reach for us. Every season as we prepare for harvest, we go through a lot of routine maintenance. It's one of the least romantic aspects of winegrowing, but perhaps one of the most critical aspects with the biggest benefit at harvest. For all the excitement of the harvest season, and the culinary pleasure and enological thrill derived at countless dinner tables from ours and others wines - it's amazing how dependent we winegrowers can be on relatively inexpensive thermostats, solenoid valves, little nuts and bolts and other seemingly insignificant items. A faulty thermostat in the middle of the night during the peak of fermentation could result in big fermentation problems. A loose nut could result in gondola of fruit being dropped from a forklift. This year, in addition to the routine maintenance, we have gone through and insulated all of our outdoor tanks. I couldn't bear any longer to have Larry, Curly and Moe greet me every morning in their previous state of undress. it was time for them to put something on. This has been on my mind for a long time, we just have a long list so got to it this year. Insulation is obviously very effective. No news there. 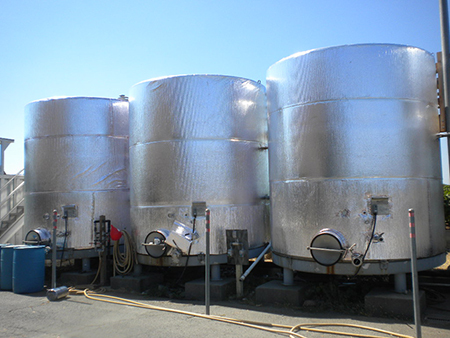 Our empty tanks used to sit in the sun at 25 degrees above ambient temperature. 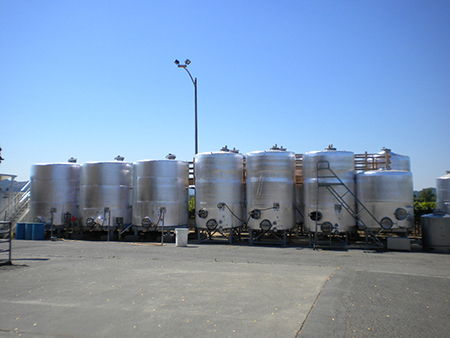 Now those same empty tanks sit at ambient temperature. As a result of the insulation, we've opened up approximately 70,000 gallons of outdoor summer tank storage that was not previously an option. We'll use less electricity and our glycol cooling system will decrease in hours of operation. Last year, we were able to observe some concrete tanks in use that were at our facility. 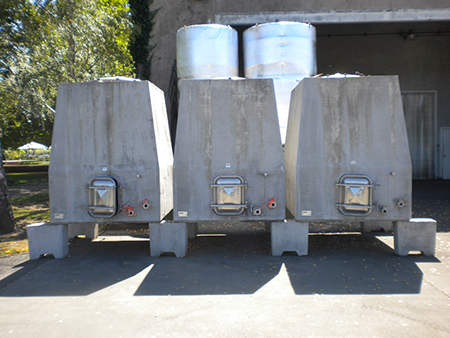 I had anticipated that these tanks would be very well insulated due tot he thickness of the concrete. I was surprised at how easilt they lost their natural heat during fermentation, and how much energy we needed to put into heating them. The resulting wine was great anyway, but the tanks performed mechanically differently than I had expected. I'm interested to see them in action again this coming vintage to learn more about them. I'm pretty excited about the insulation and think it looks pretty cool too. I'm kind of thinking of wrapping everything at the winery in this silver bubble wrap. Kind of like the artist Christo who does the wrapping installations of major architecture. Maybe. Maybe not. Probably we'll just enjoy our warm tanks in the winter and the cool ones in the summer, and enjoy Christo's art from afar. This past harvest, we had an opportunity to host some of the editorial staff at Monticello as they harvested their own grapes of our vineyard and crushed the fruit at Monticello. We all had a lot of fun. I'm looking forward to tasting the finished wine. Following is the recent article in Wines and Vines written by the editor Jim Gordon. You can link directly to the article at www.winesandvines.com. San Rafael, Calif. -- Wines & Vines staff members had a chance to put themselves in their readers' boots during the harvest of 2009, thanks to a generous Napa Valley vineyard family, a patient Marin County winemaker and a barrel-refurbisher. A small crew of people normally more comfortable with computer mouses than grape knives harvested half a ton of Merlot to make a 60-gallon barrel of wine. Along the way we experienced the same anxiety and excitement that most Northern California winemakers felt during a harvest rudely interrupted by cold, torrential rains Oct. 13 just as the grapes were nearing peak ripeness. The Knollwood vineyard from which we harvested the Merlot is a 31-acre property on Big Ranch Road about two miles north of the city of Napa, the same parcel where Lewis Cellars sits. The Corley Family, who operate Monticello winery nearby, own the Knollwood property. The Corleys bought the first 19 acres of what is now Knollwood in 1984, said Kevin Corley, and later purchased another 12 acres. 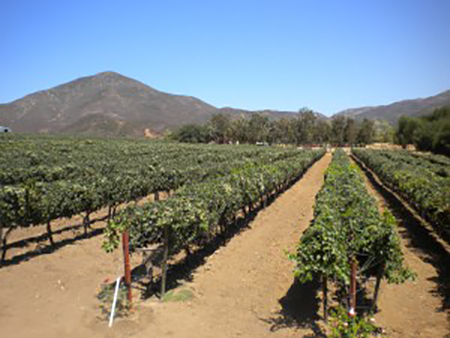 The vineyard was in its second year of organic farming. 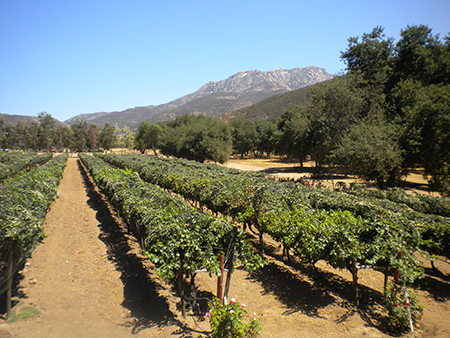 The location is in the Oak Knoll District, with Coombs gravelly loam soil and the AVA's typically cool microclimate on nearly flat terrain. Syrah, Cabernet Franc and Merlot vines grow on a few different trellis setups here. The row of 9-year-old Merlot that we picked from was clone 181 planted on 3309 rootstock and trained on a lyre system with vines spaced 10 feet by 4 feet, trained onto wires held by 36-inch cross-arms at the bottom and 52-inch cross-arms at the top. Kevin Corley said the yield is typically 4 tons per acre. We harvested on Oct. 23, having waited about as long as possible for the vineyard to dry out and hoping for the fruit to increase in sugar after the rain. Some evidence of white mold was beginning to show here and there, and berries were beginning to fall off the clusters when a vine was shaken. But the skins were intact and the flavors tasted fresh, so when Kevin Corley advised that waiting any longer would not help we harvested. Under the watchful eye of the Corleys' long-time vineyard manager, Angel Avina, we picked into lug boxes and dumped the grapes into a macro bin on a flatbed truck at the end of the row. It was a quick trip to the Monticello winery across the road, where we processed the fruit on a new, efficient sorting setup that winemaker Chris Corley was trying out. We pitch-forked the fruit onto a conveyor, which then released it into a gentle destemmer and sorting operation that enabled five people at a time to sort out all jacks and material other than grapes. The final sugar reading was 22.9 degrees Brix, and the fruit was very clean, smelled fresh and didn't appear to have suffered from the wet spell and late harvest. With the help of ropes, a tarp and plenty of duct tape, we secured our must in a macro bin in the back of a pickup, and drove it to about 35 miles to San Anselmo in Marin County, where the owner and winemaker of Ross Valley Winery, Paul Kreider, accepted it for fermentation. 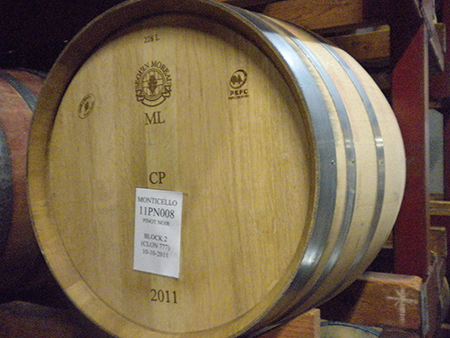 About two weeks later the wine had gone dry and was successfully pressed into a small tank to let the gross lees settle before racking into a five-year French barrel refurbished by Cryo Clean Barrel Blasting and outfitted with a stave insert array designed to give the effect of 40% new oak. Wines & Vines thanks our partners in this winemaking venture. We hope to provide readers an update on the quality of the wine later as it ages.